I wanted to pop in this morning and share a quick tutorial for an idea that I found on Pinterest! 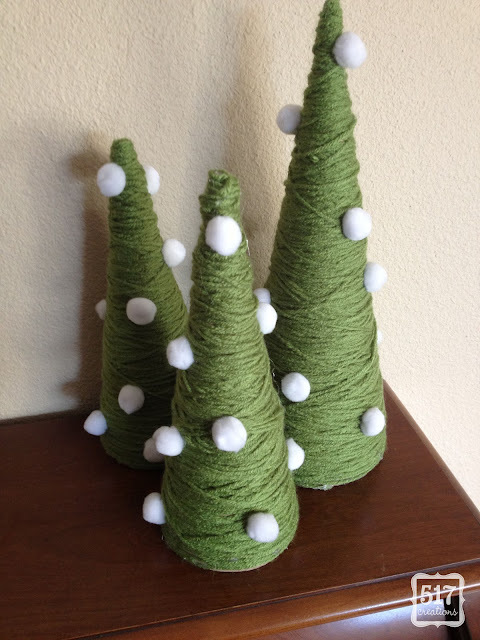 While browsing Pinterest one day, I came across these adorable yarn-wrapped Christmas trees. I loved the look but there was no tutorial! I happened upon these paper mache trees at Michael's craft store - you can find them in the Christmas craft aisle. They were available in 2 sizes, so I picked up 1 large one (it measures 13 inches) and 2 smaller ones (they measure 10.5 inches), a skein of mossy green yarn, and a bag of white pom poms. I loved the look of the felted wool balls in bright colors, but they were no where to be found around town, so I settled for white pom poms! 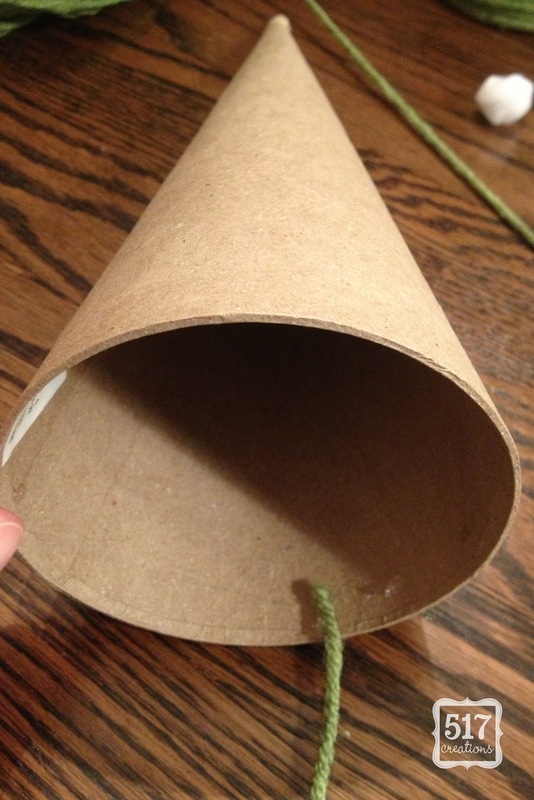 I started by hot gluing the end of the yarn on the inside of the cone to secure it. 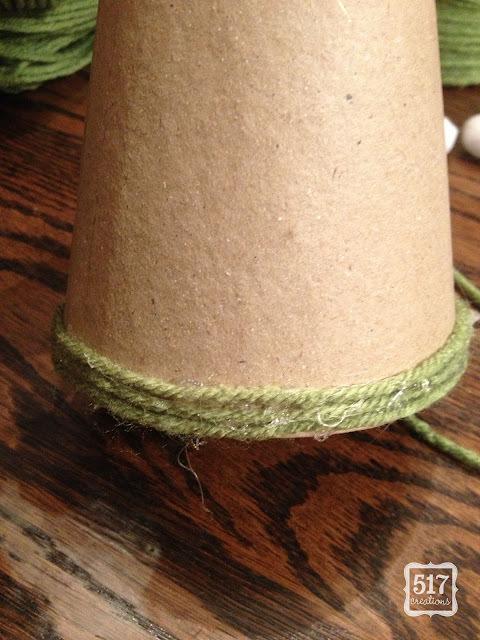 From there, I started wrapping the yarn around the bottom of the cone. I hot glued a few rows to make sure they were secure. 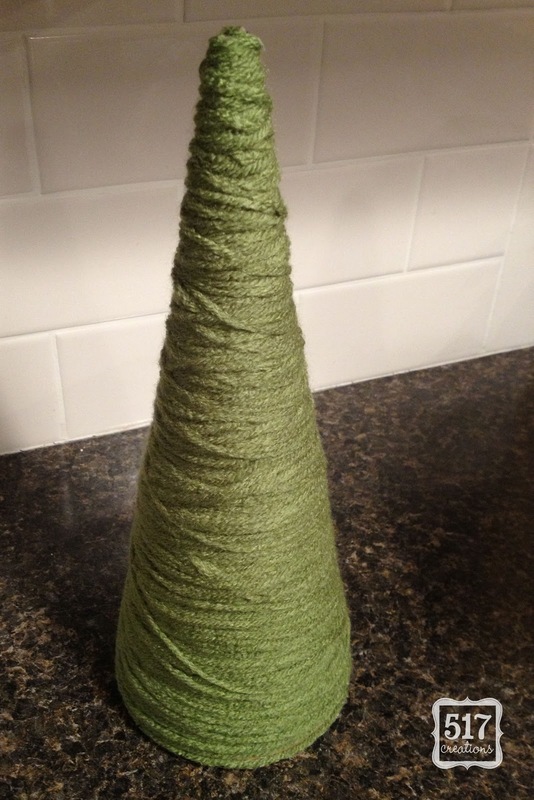 Once those three or four rows were secure, I started wrapping the yarn all the way up the cone. I didn't bother with keeping perfect rows...I liked the way that the yarn overlapped in the original pin. In fact, I thought I might need to use spots of glue all the way up the cone, but the yarn stayed wrapped pretty tightly since it wasn't in perfect, neat rows. Bonus! 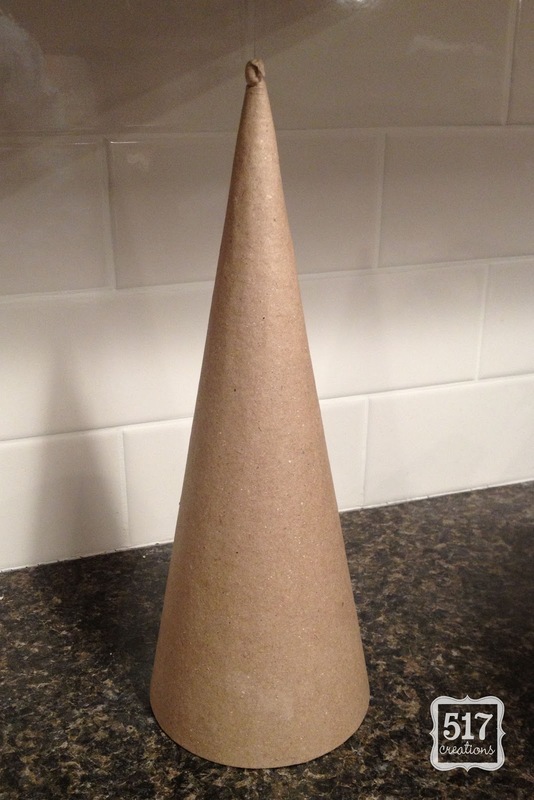 Here is the smaller cone after it was totally wrapped. It looks time consuming, but the small trees only took about 10 minutes to wrap each one! Once the three trees were wrapped, I simply hot glued pom poms randomly around the trees. All three trees in a little group on our piano! I love the whimsical look it adds without being too over-the-top. I think I might go back and add wooden stars to the tops to make them look a little more like my inspiration, but I think they look pretty sweet as they are! Have you started decorating for Christmas yet? I can hardly wait!